Please contact the office to book your place: 01984 618274 ext 1 / [email protected] Advance booking is essential for the evening meal. All diets catered for. Secrets of the Stringrays: the inner workings of playing contra dance music. 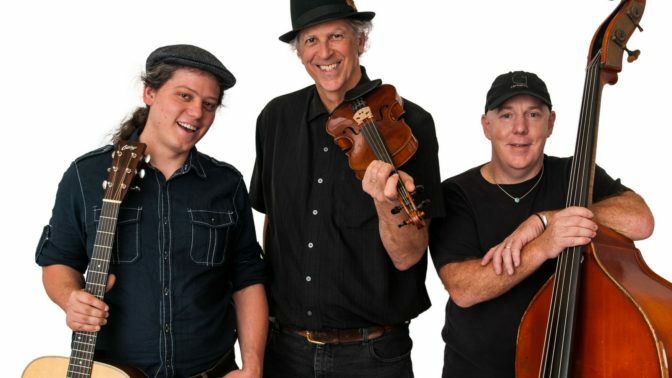 Top US dance band Stringrays are visiting the UK to play for our American Contra Dance week. As part of this event they are offering local musicians the chance to join them for a workshop. All abilities and all instruments welcome. We’d also like to invite any musicians attending the workshop to stay for dinner and join the evening dancing, at a special discounted rate of £20. Stringrays brings together an inimitable trio of musicians with a shared interest in playing and exploring great tunes. Between the fiddling of Rodney Miller, guitar playing of Max Newman, and bass/banjo playing of Stuart Kenney, their sound is playful and sublime, raucous and tender, modern and old-school. Finding constant inspiration in each other for lyrical improvising and interplay, each moment of performance is fresh, surprising, nuanced, and excellent…. Rodney Miller‘s fiddling commands the stage and the eardrums. He is well known as both a traditionalist and innovator, with a playful style and nuanced tone. He is widely considered to be the foremost exponent of New England style fiddling, a uniquely American blend of French Canadian and Celtic influences, although his exploratory style invites in quite a few surprises. Over the past 35 years, he has toured the US, British Isles, Australia and Denmark, performed and taught at hundreds of music and dance festivals, and recorded numerous albums, among them the acclaimed New England Chestnuts, Airplang, and Airdance albums. Max Newman – the youngest of the group – has been surrounded by traditional music and dance from an early age. He’s spent a good portion of his life playing dances great and small across the continent, as well as accompanying Irish music. His guitar playing is refreshing, fun, and creative, and has allowed him to collaborate on-stage with a wide swath of traditional musicians. In addition to his work with Stringrays, he also performs with Nor’easter and co-organizes several events, including Youth Dance Weekend. Stuart Kenney is the go-to man for bass thump and banjo twang! His long career in traditional music has included cutting his teeth with the legendary Dewey Balfa, and prodigious output with numerous groups and contra dance bands, including Airdance with Rodney and Undertoe with Karen Tweed. In addition to Stringrays, he plays with Quebecois band Tidal Wave and Celtic groove band The Sevens. His solo banjo album The Red Case has earned him numerous accolades.